Regular visits to Premier Dental Care are an important part of your normal oral hygiene program. Dr. Bakhtyari recommends regular maintenance cleanings every six months to keep your teeth and gums healthy and prevent any oral health problems that may arise from time to time. For children, prevention is the key. Dr. Bakhtyari encourages parents to begin regular visits to the dentist after their first tooth erupts. Early childhood dental visits allow your child to grow to be naturally comfortable with dental checkups and cleanings. Early visits also help prevent the onset of childhood tooth decay. Dr. Bakhtyari also recommends that you bring your child with you for your own dental check-ups. This allows the child to view dental cleanings and procedures as a normal, calm experience. Mature adults and seniors are as vulnerable to tooth decay as young adults and children and should continue regular maintenance visits every six months. Mature adults lead busy lives. It is easy to neglect a commitment to regular dental check-ups. 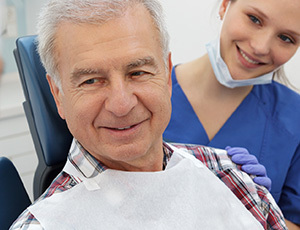 As a mature adult, you may adhere to a more balanced diet, regular brushing and flossing, and not show any symptoms of gum disease, but periodic dental exams for seniors are just as important as ever before. Did you know? Plaque left on the surfaces of your teeth can harden and turn into tartar (also known as calculus) in only 24 hours. Your daily home brushing and flossing helps to control plaque and tartar, but some hard-to-reach areas will always need special attention from your hygienist. At Premier Dental Care, there are two important parts to your regular dental maintenance visit. The first part is the check-up. The second part is the cleaning. As part of your regular dental cleaning, your Premier Dental Care hygienist will clean and polish your teeth, remove any signs of stain or plaque, discuss and recommend oral hygiene aids (electric toothbrushes, fluorides, rinses, etc. ), and, if necessary, utilize a periodontal probe to gently measure the depth of the pockets or gaps around and between each tooth and the surrounding gums to ensure that they are healthy. Once your dental check-up has been completed, Dr. Bakhtyari and your hygienist will recommend an appointment for your next dental check-up and cleaning (usually six months from your last appointment). Remember, good oral hygiene practices begins at home. Regular dental check-ups are also essential in maintaining good dental health and keeping your smile bright and beautiful.